Two days after President Barack Obama's campaign put out a brutal ad making fun of Mitt Romney's singing abilities, the Romney campaign responded in kind with a web video mocking Obama for singing Al Green's "Let's Stay Together." This video is no longer available due to a copyright claim by BMG_Rights_Management. "Our use was 100% proper, under fair use, and we plan to defend ourselves," said a Romney campaign spokesperson. BMG did not immediately return a request for comment. The Romney ad seems like as clear-cut a case of fair use as can be imagined. Obama's singing is a core part of the ad's message, and copyright law explicitly mentions commentary and criticism as justifications for fair use. And it's hard to imagine the ad harming the market for Al Green CDs or iTunes tracks. Yet the "notice and takedown" process established by the DMCA [Digital Millenium Copyright Act] and apparently utilized by BMG in this case doesn't give the Romney campaign much recourse. It can file a counter notice stating that it believes its clip to be fair use, but YouTube is required to wait a minimum of 10 days before putting the video back up. In a campaign where the news cycle is measured in hours, 10 days is an eternity. UPDATE: 11:05 a.m. -- Regarding the copyright claim, a BMG spokesman told The Huffington Post, "Our duty is to protect the rights of our songwriters and other clients without regard to political party or cause. In this case, the use of the music in question was not approved by the rights holder. As a result normal take down procedure was followed." 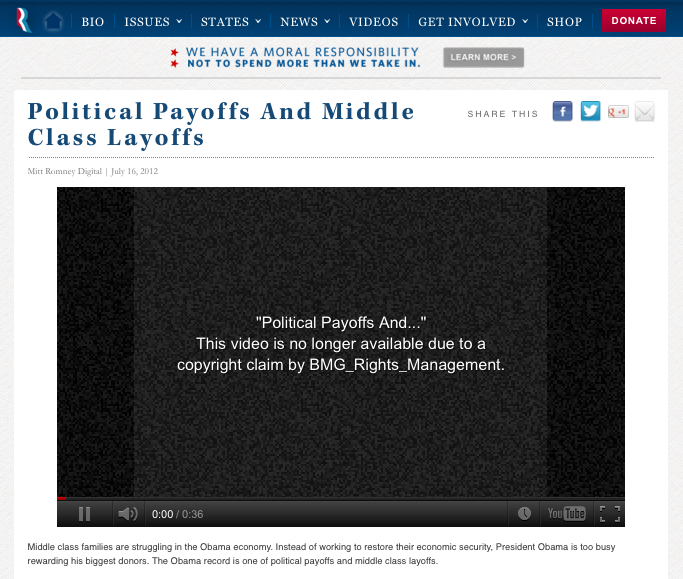 UPDATE: 7/19/12 -- The video is now back on YouTube, reports Politico.